Seilevel has produced many white papers, reports, and other resources for business analysts on RML and proper requirements methodology. Here are a few of those resources; also see Visual Models for Software Requirements. 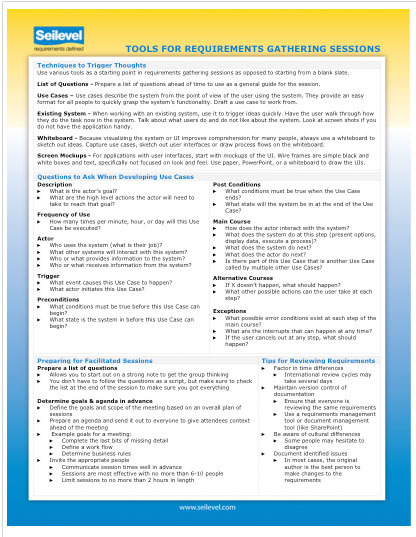 In our Requirements Core Concepts Handout, you will learn techniques to trigger thoughts, questions to ask when developing use cases, how to prepare for facilitated sessions, tips for reviewing requirements and requirement types, and examples. In our Business Objectives Model (BOM) Handout you’ll learn how to model the value that a project will bring to the customer. Utilizing the Business Objectives Model guides the identification of appropriate business objectives and the process of selecting in-scope features. In one of Seilevel’s projects, Seilevel documented the requirements for a sales platform. The initial adoption of this platform in just one segment and region has resulted in an increase of over $9 million in additional annual margin. The requirements gathering effort for migration projects is notably different than that for a new system being built from scratch or for adding new functionality to an existing system. Today, the top three reasons software projects fail are lack of user input, incomplete requirements and changing requirements. Seilevel’s rigorous approach to requirements gathering tackles these issues. Learn how Seilevel’s expert requirements analysis helped a client cut 80% of the original scope yet produce an initial release that would still generate significant business value. RML® is a language for modeling software requirements to organize and communicate large quantities of information, help identify missing requirements, give context to individual details within the overall collection of requirements, and represent different views of requirements’ details. Globally, organizations are improving the success rate of their software projects by focusing on the quality of their requirements. Discover the five steps to building an effective requirements team. One of the biggest difficulties every project faces is deciding how much time and how many resources to devote to requirements gathering and documentation. We have created a tool for calculating all facets of the requirements estimate. The assumptions in this estimation tool are based on Seilevel’s experience on years of actual projects. The instructions tab is where you will find detailed help on how to use the estimation tool for business analysts. This is a concise description of all the elements contained in a complete Use Case. You can find additional resources related to RML and using visual requirements models at http://requirements.seilevel.com/blog. This Excel template provides a scorecard for evaluating a variety of project types and phases to assess project execution. This paper outlines the important steps Seilevel has defined to have successful elicitation sessions and improve quality of time with stakeholders. Seilevel’s methodology includes the use of a requirements tool whenever possible to manage requirements. Since finding the most useful tool is critical, Seilevel has completed primary research to evaluate the range of tools currently available. We evaluated tools for our own use and for client use, and chose to share our methods and findings with the larger business analysis community. You will find this information useful whether you are currently using a requirements tool or are considering using a tool. There are more than 100 requirements tools on the market; finding the best tool for your needs requires a comprehensive evaluation of the options available. At Seilevel, we are particularly interested in advanced modeling functionality within the tools to support RML®, the visual modeling language we use for software requirements. Compared to earlier requirements tools research we did in 2011, a number of tools now support RML, and there is also better support now in general for working offline. Here are some resources that may help you evaluate which requirements tools are best for your organization.